Trade, Tourism, and Investment Program (TTI) brought professionally managed programs to 15 American cities concurrently with the Festival of Indonesia during 1991-1992. Presentations included overviews of Indonesia’s economy, trade and investment opportunities, and one-one-one meetings with Indonesian businessmen and government officials as well as separate events for travel agents. 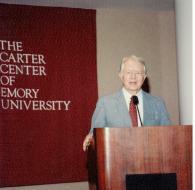 One of the highlights was the TTI event in Atlanta opened by former US President Jimmy Carter. TTI programs took place in parts of the US that had few commercial connections to Indonesia (Minnesota, Oklahoma, Ohio) and led to many new business transactions and increased the number of visitors from the US. TTI employed no government funds, utilizing sponsorships and other advertising revenues. It required a high level of trust between the Indonesian Chamber of Commerce-US Committee (KADIN/KIKAS) and the American Indonesian Chamber of Commerce.